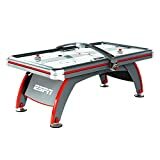 If you aim for neighborhood bars or arcades to seek out air hockey tables more frequently than you care to admit, you might want to consider a new toy for your home and save yourself any further trips. Whether you plan to place it in your unfinished basement, recreation room or game room, an air hockey table makes a delightful edition! But if you’re kinda lost and overwhelmed with the array for tables available, what to look for, and how to choose the best—take a look at this handy guide and even discover a few great models. Air hockey tables can be rather large. So before considering one to purchase, know where exactly it’s going. If you have a spacious basement rec room or game room, you might not have to worry. But how will you get it down there? Is there a door it can fit through? Or can you assemble and set it up yourself once indoors? Finally, once you determine a table can relatively fit, decide how big you want it to be. 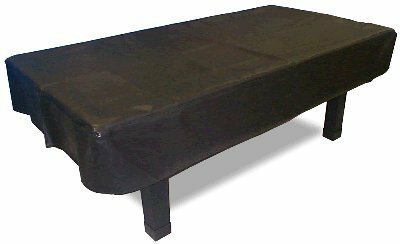 Some tables can be found only a couple of feet wide and extend up to 4 feet wide and 8 feet in length. But whatever you decide, check and see if players have enough room to move about. Generally, a 36-inch space will suffice. Another feature you should be aware of is the small puck size. Typically, the puck size will always be relative to the table size (more on that later). However, a small puck is a tell-tell sign of a lesser made product. Look closely and you’ll discover the table is made of low-quality construction. While everyone has a budget in mind when looking for a table, this is something to keep in mind while shopping around. Consider if you’d rather save and put forth more money or find a broken blower engine from a cheapo model in only two-years’ time. And larger pucks have more surface area to catch air and glide. Mostly, you’ll find these to accompany commercial USAA-sanctioned tables, and it also hard to come across budget-friendly ones, but at least stay away from the cheaper air hockey table models and save your sanity. One small detail that you may find on an air hockey table is side walls. If you’re an aggressive air hockey player who tends to strike hard, consider choosing a table with side walls to keep your puck from flying off. Of course, check the material of the side walls. Is it solid or flexible? Solid side walls bounce off a puck better, without slowing down the game. If you ever played air hockey on an original Brunswick table, you might remember the abacus-style scoreboard at each table’s end. There was a certain satisfaction in hearing the slide-click of your new score. And while you can find that in more vintage, used air hockey tables, it’s quite hard to find today. Instead, you’ll find more modern digital scoreboards, sometimes even with a touchscreen. And with these more electronic tables, the blower knows to stop when the game’s won. But what if you’re just at home and want to continue playing? Another advantage of not having a digital scoring system? Accidental goals can be ignored. Air hockey mallets, also called “pushers”, “strikers”, “goalie mallets”, and “paddles” (although ping pong more so comes to mind when I hear that), are an important consideration. From mallet size to felt bases, here’s what to consider. Mallets vary in diameter from a couple of inches to four inches. Generally, this is relative to the size of table—the larger the table, the wider the mallet’s diameter. Mallets can also be found with and without felt bottoms. While this is mostly only a personal preference among players, the felt does offer some advantage that has nothing to do with speed. Air hockey mallet felt protects the table from being scuffed up. Some players, however, feel the felt is a disadvantage and slows their reaction time. Pucks also change in sizes, again, relative to the table’s size. Smaller pucks are around 2 ¾” diameter and used on smaller tables around 6 to 7 feet in length. A larger puck of 3 ¼” diameter is more ideal for tables around 7 to 8 feet in length. Of course, these standard sizes are thrown out the window when you use various pucks shapes like triangular and octagon. They make for one interesting, difficult game. They add some trickiness to the playing field, but are a heckuva lot of fun. You can even find glow-in-the-dark pucks that react to blacklight. Air hockey tables are a throwback to the 1970s, which makes them hard to find (at least one in decent shape). However, if you’re dead set on finding one for yourself, here are a few recommended tips to make sure you’re not buying a lemon. Water and even high humidity can destroy games such as these. They’re pretty much constructed of MDF after all. So check for obvious water damage. Also, don’t rely on photos and go see the table for yourself if you can. Just eBay photos alone can’t tell you the condition of the blower motor or playfield, which is costly to replace. Check for dirt, debris, or anything else you may find. Sometimes, an air hockey table can pass from through a few mallet-calloused hands before you find it. It’s quite possible drinks have accidentally spilled on it, or that it was stored in a dusty old basement for a long while. Just keep in mind these pinholes are difficult and time-consuming to clean. 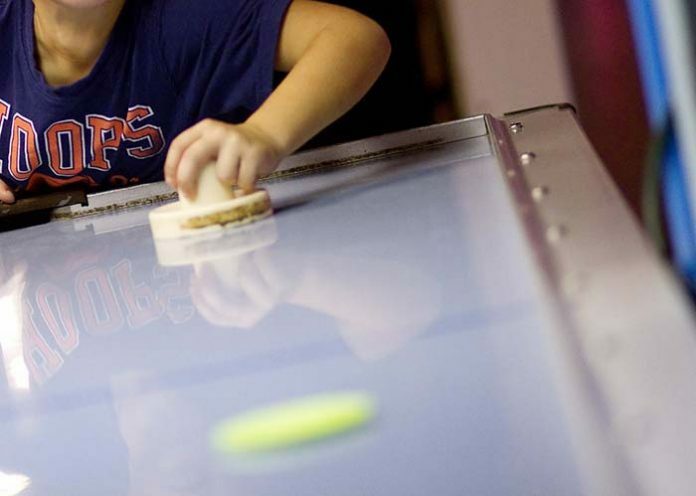 New air hockey tables may lack that nostalgic charm you wish for, but they do have their advantages. Warranties – Like mentioned, there are cheapo table models out there. But as opposed to a used table, newer models will come with warranties. Newer Material Construction – Air hockey tables are made of either solid wood or MDF particle board. If you want to practice your swift air hockey moves in the comfort of your home, you can! From combination game tables to pro-size air hockey tables, you can find practically anything available. However, if you’re watching your budget and can’t quite afford a United States Air Hockey Association (USAA) Sanctioned Table, which costs upwards of $5,000 to $7,000, you can still find something under $1,000 that works just as well for home entertainment. Also, so as not to overwhelm, this list has left out tabletop air hockey and multi-game tables (like the ones that turn upside down to reveal a pool table or foosball beneath). Instead, this list focuses on free-standing, air hockey-only tables. Here’s a breakdown of the best air hockey tables for homes. 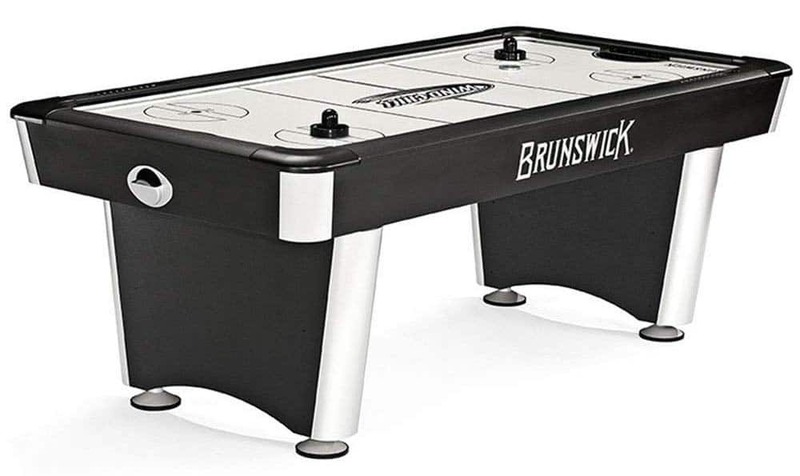 This Brunswick 7-foot air hockey table offers a more modern design than their original 1970s versions. But it’s still as aesthetically pleasing and durable. The Brunswick Windchill holds up with great, high-quality materials. Keep score with the abacus style point system—ideal for air hockey purists. And also sidewall rails that overhang, which prevents pucks from flying off. Not to mention the powerful electric UL blower that pushes out great air for competitive games. 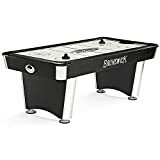 You’ll find several similar models, but Brunswick hasn’t lost its reputation, and offers a 90-day Manufacturer’s Warranty. 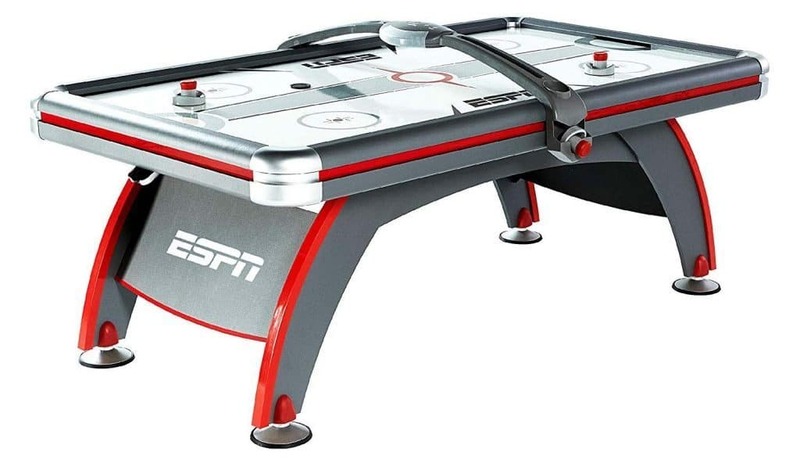 The ESPN Silver Streak is a more modern air hockey table. This tables scoreboard is electronic, which means you won’t get that satisfying swish of the abacus. But most modern tables are like this anyway. Instead, the scoreboard kit includes an LED touchscreen. Well-distributed airflow is provided by a 120V UL-certified motor, meaning pucks will glide easily and smoothly across the high-gloss surface. This table’s size is quite large at eight feet, and heavy! 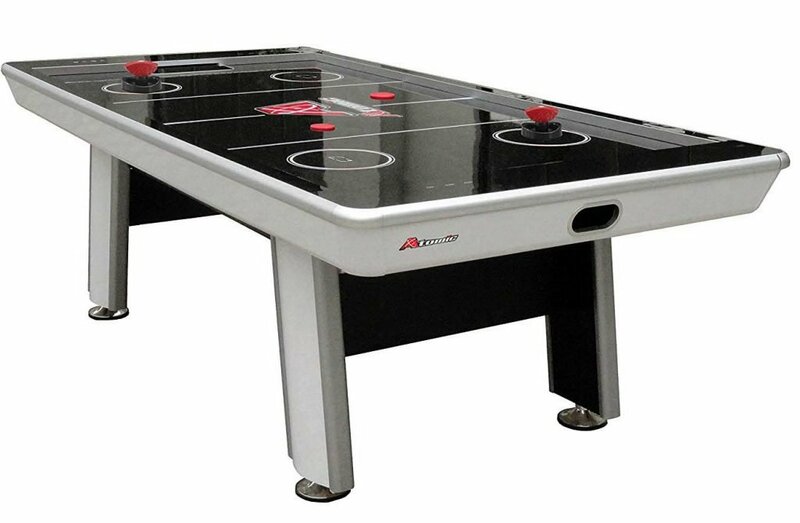 It offers full 6-inch panel legs, which supports players who tend to lean into the table, and a playfield apron and top rail. The playing surface is constructed of 1-inch high gloss MDF above a 120V blower for super-fast swipes during games. The size of the table, however, is a bit deceiving. 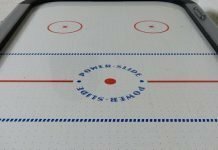 Although the table size proclaims to be 8 feet, the actual playing surface is minimized to 42.5″ x 80.75″, which shrinks the table considerably. This may not be a big deal to some, but it’s just something to be aware of. The 5 ½” leg levelers are a nice addition, as well as the LED electronic score display and touchscreen controls. Also, it seems the engineers could’ve thought through the “touch” buttons a bit more. Where they’re installed makes it annoyingly easy for players to brush against and mistakenly push, which restarts the game and resets scores. You’d be mad if you were in the lead. One nice feature of this table is its color. Air hockey tables typically have a white surface. But black surfaces tend not to show scuffs and markings. This table includes two ergonomic mallets and two pucks. If you like to play in teams and need additional mallets, don’t worry—you can easily purchase more. Once you decide on the ideal air hockey table for your home, you may want to invest in some extra accessories to complete the package. You may think a table cover is not a big deal and forgo the expense. But the benefits outweigh the cost. First, the cover prevents dust and particles from entering the microscopic perforations that give your puck that lift. Second, you can eventually wind up with lower air flow or even a “dead space” where air no longer even puffs. Worse still, dust and particles will eventually make its way inside your blower motor and become trapped, which can drastically reduce your table’s lifespan and eventually kill it. And of course, a table cover makes your game or rec room look a bit more orderly. Most of the above air hockey tables come with leg levelers. However, if you find one that lacks this ability, you can still install your own if you’re a professional or just plain nitpicky about the precise level of your air hockey tables playing surface. 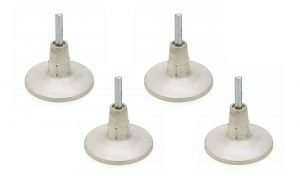 These work especially well if you put your table in a basement with uneven slab concrete. I’ve seen players strike a puck clean off a table and their dog run away with it like it’s their new favorite chew toy. You’re likely to lose a puck or two (for whatever crazy reason), so why not just purchase a stash for safekeeping? Maybe you wanna somehow coordinate your table with your rec room’s color scheme. Maybe you have several kids who each want their own personal puck with a signature color. For whatever reason you find yourself needing non-standard red pucks, here’s a multi-colored puck set to add some color to your air hockey table. While mallets rarely sprout legs and walk off, their bottom felt does tend to wear down. Especially if you enjoy your air hockey table frequently. When this happens, you can easily purchase and replace the felt! You can get them in classic green felt or white felt. Find the Perfect Air Hockey Table Yet? Air hockey tables are quite large pieces for your game room entertainment. And you probably want to protect your investment. 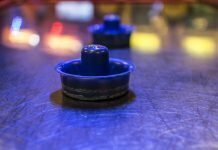 So once you and your family decide on the perfect air hockey table, I’d recommend following this maintenance and cleaning advice of Bubble and Air Hockey to keep your table in tip-top shape. That way, you can enjoy it for many years to come! 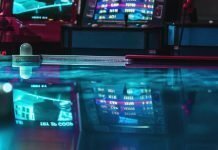 And of course, if you just thought it would make a nice addition and are a complete novice, become familiar with the basic rules of air hockey. You might just learn a trick or two!